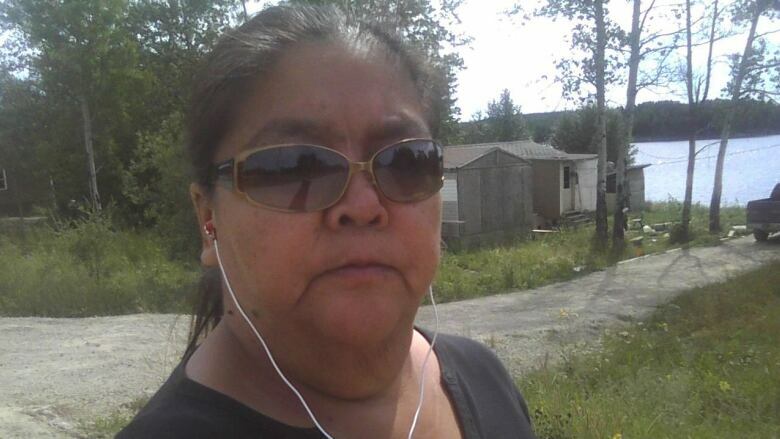 Clara Monias once got her diabetes under control by walking around her home community of Garden Hill First Nation. Her condition worsened after she got out of the healthy habit, and now the grandmother is hoping to step up once again after her brother died of diabetes this month. It was exercise that got Clara Monias moving her feet and taking control of her diabetes. But after getting out of the habit her condition worsened, and now the grandmother — once dubbed "The walker of Garden Hill" — is charting a path back down that road to good health. It was thinking about family that pushed Monias to make a change in 2011. "I wanted to be healthy for my grandchildren so I can take care of them. I've got 14," said Monias, from Garden Hill First Nation, about 475 kilometres northeast of Winnipeg. Her health did a 180 after she began walking daily. She felt active and her health was in control. The walking routine fell by the wayside, as did the health benefits, but the improvements Monias once experienced are backed up by science. Last week, Alberta-based Dr. Raj Bhardwaj told CBC News about exercise prescriptions and the importance of movement for our overall health. "These benefits of exercise and activity don't require you to lose your weight or lower your [Body Mass Index]," Bhardwaj told CBC Information Radio host Marcy Markusa. "It's all about increasing your fitness, improving how your heart and lungs and fat and muscles function, and weight really has very little to do with it, if anything." The benefits include lower mortality rates, and lower cholesterol and blood sugar levels among those living with Type 2 diabetes, said Bhardwaj. The outcomes over time can help people lower their diabetes medication doses, he said, or even in some cases get off the meds entirely. Monias did just that in 2011 — she walked herself right off of her diabetes medication. Back then, Monias walked every day for an entire year. She remembers the first step toward a more active lifestyle felt like climbing a mountain. "It was tiring and seemed so long," she said. "It was hard." Her arthritis meant Monias was in pain, but she kept at it. At first, her route took about two hours, but little by little she shaved off time. Soon, she was walking her circuit around Garden Hill in 45 minutes. The arthritis pains subsided and she began to ease into lower doses of her diabetes medication with guidance from her doctor. Weight loss wasn't necessarily the main thing driving her at the time, but the walking came with a few of the added benefits noted by Bhardwaj. Monias's blood sugar came down and she felt energized and less tired. She went from 300 pounds to 190 pounds, Monias said. After moving away from Garden Hill for a time, the walking routine — and the physical gains — faded away. "I lost everything and I have my health problems back," she said. "It changed very quickly." Her blood sugar levels spiked, and her arthritis aches and pains returned, said Monias. Though she remains 190 pounds, she is back on medication. Monias wishes she hadn't stopped. It was that lingering disappointment and the recent death of her brother that has Monias vowing to get in motion again. Her brother had his leg amputated and died due to diabetes-related complications, said Monias. "Me and my brother were very close, and he died of diabetes," she said. "He told me to start walking again, to take care of myself again. He always urged me to do it." Now back in Garden Hill, she plans to start working out at the fitness centre at a local high school — where she got her start before developing the walking routine in 2011 — before heading back out on the road. To the naysayers and doubters, Monias said walking made a big difference in her life, and she knows it will again. "I know I can do this again. I did it before," she said. "I'm going to."